14/12/2013 25/01/2016 Cherrie Zell2 Comments on Why am I standing on the Road’s Edge? Why am I standing on the Road’s Edge? At heart, I’m very unstructured. I wanted to be an artist; I wanted to be lots of different things down through the years, but for this post … I wanted to be an artist. Many of the artists I see in documentaries are very structured. So to get myself started, I embarked on a series. I embarked on a number of different series down through the years, but this one stuck. Road’s Edge developed beyond an idea into a photographic series because it was practical and loaded with possibilities. It had built-in structure. In this post, I’m looking at the Road’s Edge category and asking why did it start, how does it fit and where is it heading? My blog needed some housekeeping after transferring it to the new 2014 WordPress theme. What is a blogging category? Within a blog, each post can be allocated to a category. The category becomes a story. It is created for a reason; it evolves; it has high points and lows. It might eventually end. The first installment in the Road’s Edge series happened because I’d started blogging. There was now somewhere to “exhibit”. However, as you can see, I was still finding my feet. The series was supposed to be about ideas, not scenery. The rules were simple. Stand on one side of the road and point the camera directly across to the other side. The edge of the road must run along the edge of the image, preferably parallel. 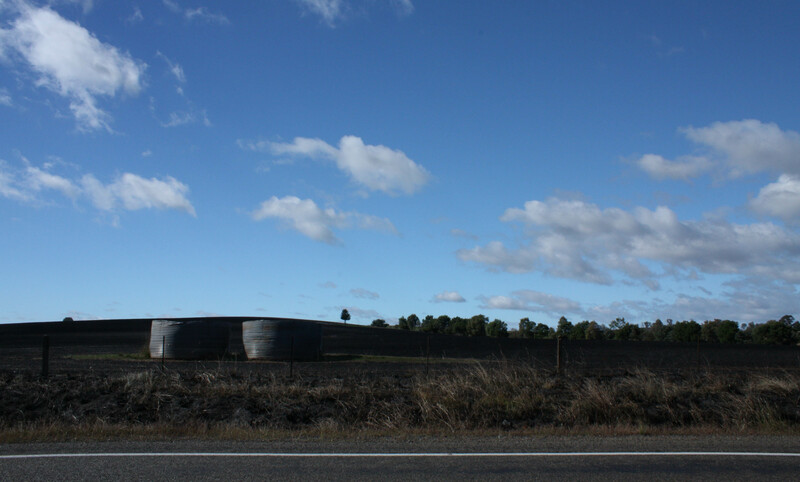 I wasn’t looking for panoramic shots that overpowered the presence of the road. It’s presence became conceptually significant as the series developed, even though it only occupied a small proportion of the foreground. Sometimes, my Road’s Edge image was too laboured, where the concept I think I’m illustrating is too much of a stretch for the image. Or the image itself doesn’t work. 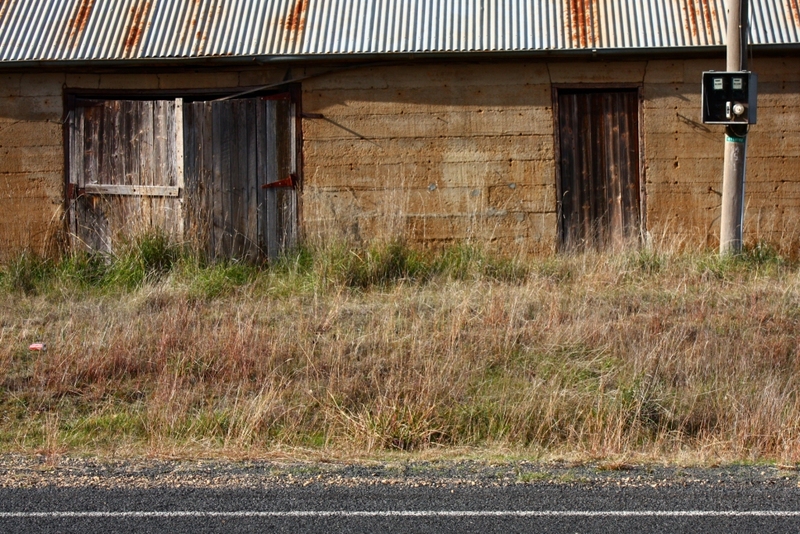 The subject of Wombat Road was striking – an old building, seemingly made of the earth itself, sits beside the intense blue grey of modern bitumen. However, the signature image doesn’t capture how close this piece of history is to the road. The image doesn’t say anything by itself. The post was only saved by a suite of additional images and a chunk of explanatory text. 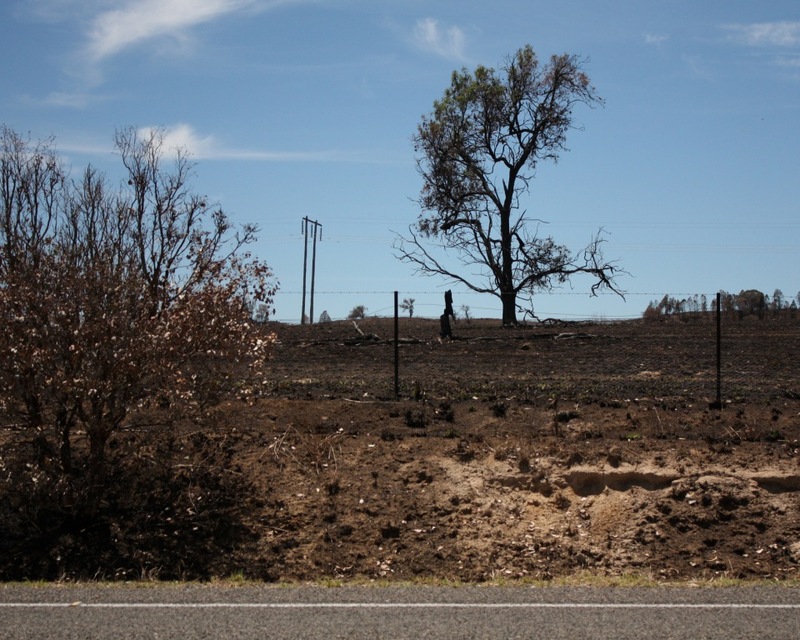 Boorowa Grass Fire was, for me, a significant road’s edge. Fire and the threat of fire was always treated with respect when we were growing up. When I first drove through the area, the fire had not long been extinguished. I would not stop. Photo journalist I’m not (yet!). On my return a few days later, many of the large trees near the road had been removed. The ash had blown away. There had been some rain. The threat had clearly passed and it felt safe to stop. It will always be a reminder of the Edge image that could have been. Does this category fit with my blog theme? The overall blog theme is exploring. Explorers of old often stood in a place of transition between the known and unknown; that is, between where they had just been and where they were heading. They themselves were instigators of transition, when news of their exploits and maps of their journeys triggered social change. Road’s Edge is a symbolic point between two worlds. A myriad of topics reside in these places of transition, these places of boundary. The category fits. It will stay. Where is the category heading? The category has been bubbling along without too much problem, and I suspect that dramatic changes are unlikely. The original rules evolved, and may evolve further as the ideas generated by the road’s edge develop. For example, the edge of the road no longer has to run along the image’s edge, though often it still will. The temptation to post some weak images was resisted, but not always. In future, the signature image must be meaningful on its own. It’s OK to write an essay, if I’ve got some spare to time to do the research, but the image must be able to stand on its own. Love the shots… and the sentiment! Previous Why a blog category called Challenges?